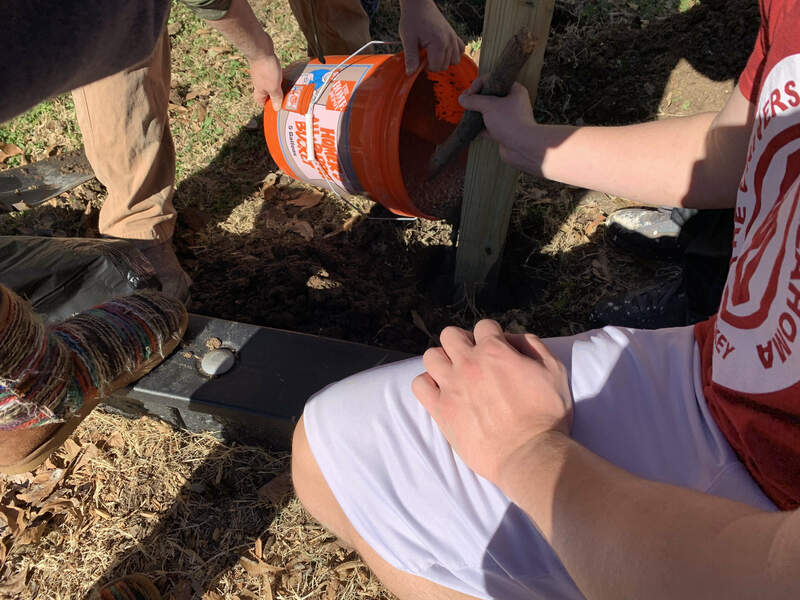 Engineers Serving Others is a community service based multi-disciplinary engineering organization on campus that focuses on using the skills learned in our engineering classes and putting them to use in assisting nonprofits and other organizations in the surrounding community. Whether by project groups or volunteering opportunities, Engineers Serving Others works to create a fun and personable environment for its members as we strive to assist nonprofits and organizations in the community. Project groups range from designing and creating sensory playgrounds and gardens for children with disabilities, such as the CCFI or Lincoln Elementary project groups, to writing programs for organizations to help foster and expedite efficiency, such as the Meals on Wheels Route Analysis project group. ESO offers many opportunities to volunteer, and the most important by far are our project groups. Project groups are a way for us to help solve problems or promote efficiency in an organization, but over the span of an entire semester. Though many project groups take only one semester to finish their projects, like CCFI, others may take longer due to difficulty. Either way, project groups are always being assigned every semester, and it is our best way of solving problems effectively and efficiently. Students in project teams usually get the most out of their experience with ESO; a person will end up spending a fair amount of time using the skills learned in the classroom to try and solve the problem at hand with a small group of other individuals. This is extremely important as it teaches skills necessary for the work environment, such as compromise, teamwork, and patience, since not every group member will be in the same major, and not every group member will agree on how things should be done. Likewise, these students not only get to learn to work in groups, but they also get to experience real-life problem solving in real-time. Through project groups we've helped a number of organizations on or around campus and the surrounding area. These include assisting in layout redesign for the OU Food Pantry, creating route analysis software for Meals on Wheels, or designing, building, and implementing new playground equipment for organizations such as CCFI or Hope Retreat Ranch. Project groups make up a good portion of the work we do. Faris Khaleeli finishing the wobble bridge at Hope Retreat Ranch. Many volunteers gather around to concrete the CCFI wobble bridge. Project groups are not the only way for members to get involved. We also typically hold monthly volunteer opportunities, in which we've helped a plethora of different organizations, from volunteering at the Oklahoma Science Museum's Tinkerfest, to just assisting different food pantries, such as the Moore Food and Resource Center, the OU Food Pantry, or even helping to cleanup trash around Lake Thunderbird. Beyond that, we often hold a retreat, in which we set aside a full day to complete projects together as a group. 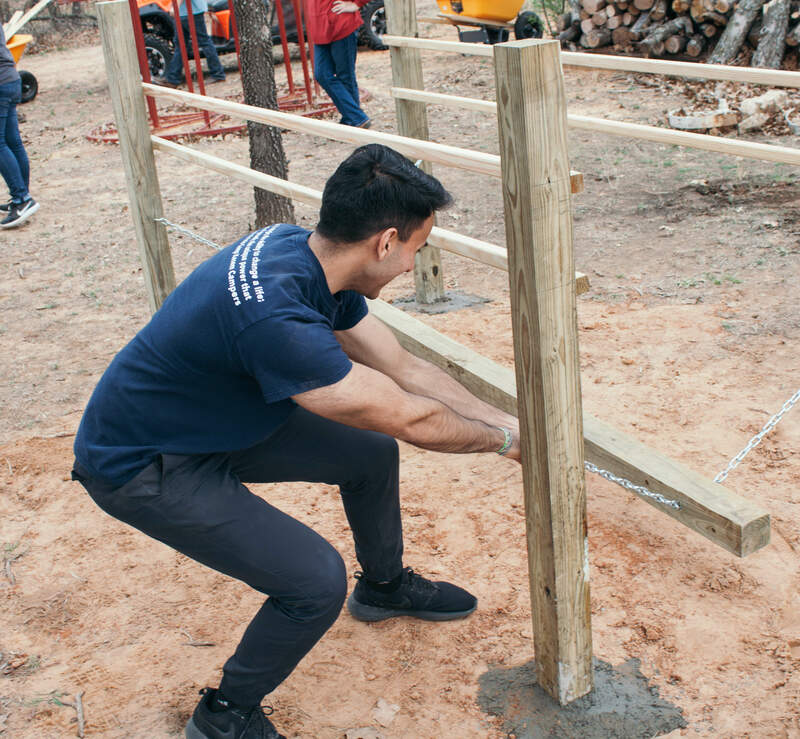 Last year our retreat was building the playground that the Hope Retreat Ranch project group designed, and helping them with other things too, such as moving and storing equipment and furniture. 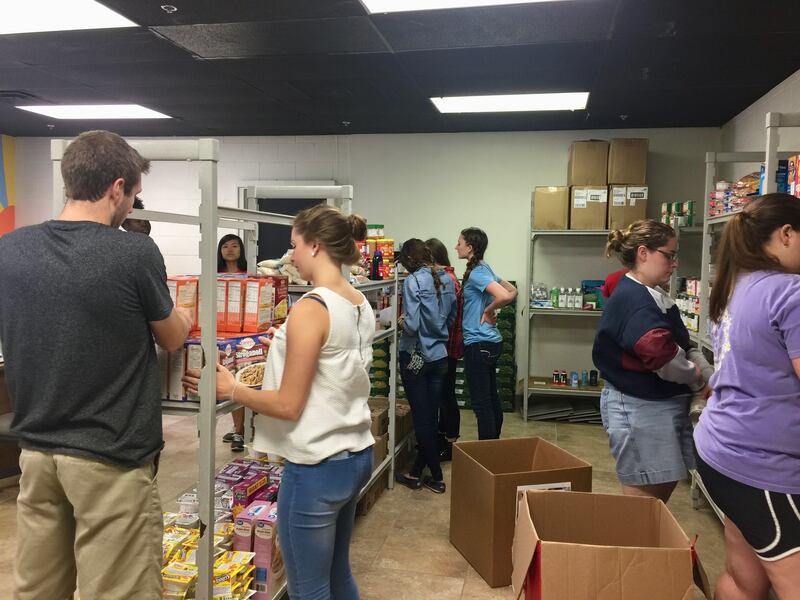 Volunteers helping at the OU Food Pantry. Though being a very new and revamped organization, we've already reached out to and touched over 150 students across campus, whether through our general meetings, project groups, or by our various volunteering opportunities! We've already reached out and touched a good amount of organizations, and we hope this list will continue to grow the bigger we get, as more organizations turn to us for support! Your support of our Thousands Strong campaign helps us enrich our community and grow our impact. Thank you for your support and please feel free to share this campaign via social media or email! A donation of $5 could buy us a can of paint, screws, or could be used for various supplies needed to build playground equipment. A donation of $20 can help pay for fuel so our members can drive to other locations for volunteering events. A donation of $50 or more can completely pay for a ball toss, helpful for building understanding of depth perception, and other supplies useful for building other equipment. A donation of $100 could help pay for an entire general meeting, helpful for us as we do a majority of our building of the equipment together at these meetings. A donation of $150 could pay for an entire wobble bridge, good for helping build balance and coordination, as well as other supplies. With a donation of $500 or more, you will be able to request a full sensory playground at any nonprofit organization or school of your choosing for us to build! This includes a ball toss, a wobble bridge, and one other sensory item.